I was just walking through downtown Vegas when a cover band started up with a familiar tune. Presented here so you can take the same trip down memory lane to the late 1970s that I did. I just looked at today's installment of "+EV." 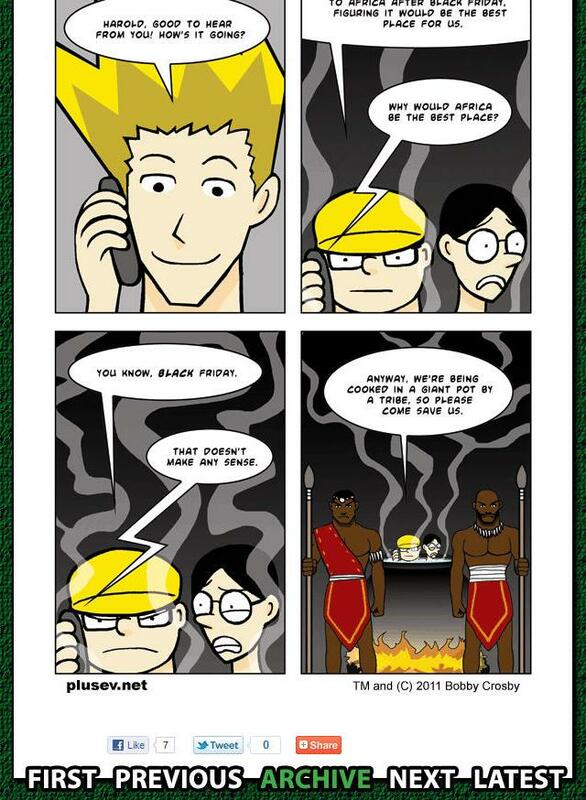 I've been reading this poker-themed web comic strip forever and generally like it. But today? Stunned is all I can say. I'm hardly the most politically correct or oversensitive guy on the planet. But explicitly and casually lumping together Africa, blacks, and tribal cannibalism, and expecting that readers will find in it light amusement, demonstrates an ear far deafer to contemporary sensibilities than I think I can be accused of ever having been. Didn't humor of this variety die out about the time that Amos and Andy went off the air? As commenters have noted, the link above no longer works, and the cartoon in question appears to have been taken down from the site. The archive is here, and the one for October 26 doesn't show up there. I have no knowledge of what happened, but since the comic's author submitted a comment here defending his work, I doubt that he had a sudden change of heart. Given that the series is sponsored by a prominent online poker site, I would venture a guess that the sponsor was displeased to see its name on that particular strip and asked that it be removed. I saved a screen shot of the page, anticipating that something like this might happen. (Somehow the top edge and a few words of the text got cut off, and I didn't notice it until now.) I didn't post this at first because I preferred to direct traffic to the site of the original. But since it's not there anymore, there's no way for people to see what I was describing. For that reason, I post it below. Shamus pointed me to today's Jumble, which is poker-themed, here. It took me 13 minutes to solve it. Today I met a friend for lunch at the new Hash House a Go Go inside the Plaza downtown. On my walk there, I passed another new restaurant that I don't think was there last time I went by. It's the Heart Attack Grill. As you can see from the big sign that hangs outside of it, if you're over 350 pounds, you eat for free. 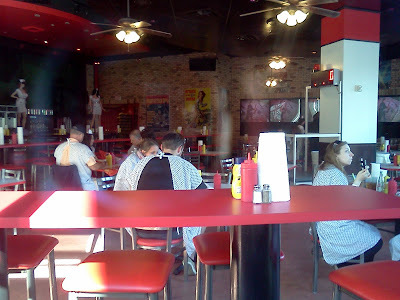 Their waitresses are dressed as nurses, and customers are given hospital gowns to wear while they eat. The burgers--which seems to be the main fare on the menu--are graded single through quadruple "bypass." You can get a side dish of "Flatliner Fries." Etc. I'm not sure whether to be amused or appalled by the whole thing. I must remember never to fold anything. I'm still in the free trial period for Poker Tracker 3, and I'm sure glad they offer one, because I'm not feeling inclined to buy it, and if I had paid for it, I would be getting even more irritated with the product than I am now. It's buggy. At least three times the HUD has vanished for no apparent reason in the middle of a game (or two or three), and the software won't respond to any commands. I have had to resort to the Task Manager to force it to shut down, then restart. It also occasionally does weird things such as shown above. I was doing two SNGs at a time, as I commonly do. It seemed to be working normally, but then the HUD blinked off on the game on the right. It took me several minutes to notice that the HUD on the game on the left had changed in a rather important way at the same time: It was now showing me stats for the seats on the right-hand game! If you look closely, you can see that the names in the HUD match the corresponding seats in the other game. If I had changed the display to omit the players' names in order to save screen space, as one commenter suggested when I first installed the program, I would never have noticed this, and would have been relying on completely false numbers. That is completely unacceptable. Erroneous data is far worse than no data at all. And it does compile erroneous data. In one game, I raised the very first hand with K-K and won, but for another 20 hands or so, until I raised pre-flop for the second time, it continued to show my pre-flop raising percentage for that table as zero. Yes, Tracker had been on and set to import hands well before the SNG started. That makes me wonder what else it's missing or getting wrong that I haven't noticed. The HUD blinks off for several seconds when it's updating. Annoyingly, this is often right when I need it most, when somebody has put in a raise and I want to evaluate how much weight to give it. BOOM--HUD is off for five seconds or so, and I don't know how long until it will be back. Extremely irritating. I had heard that one needed to do periodic maintenance on the database in order to keep it from getting bogged down. I went to the web site for "how-to" instructions on this. The options for how to do this maintenance were baffling. I'd like to think that I'm a pretty smart guy, and I definitely have more education than any decent person needs. But I could not make heads or tails of what this section of the FAQ was trying to tell me to do, nor why. Similarly, I had noticed a feature about marking hands for later review. Great. I figured out how to mark one during a game. But then I wanted to find it to, y'know, do the "later review" part. Checked all the menu options and tabs I could find--nothing. Went to the web site, finally tracked down a couple of places where people were talking about this feature in the forums. Apparently I am not the only one to be confounded by how to employ this feature, because there was more than one question about "where are the marked hands?" But even when I tried to follow the instructions provided, I couldn't. I simply could not find the sequence of steps/options they were trying to get me to follow. Again I emphasize that I'm not a generally dense or helpless person. I can nearly always get computers to do whatever I need them to do, and I can follow directions as well as the next guy. If I can't figure out how to do something that should be incredibly simple--like find a hand marked for later review--even after I've read your instructions, then the software is badly designed, the instructions are poorly written, or both. My final gripe is that the HUD doesn't do one of its most basic tasks consistently, at least on Bodog. If there is a bet and call on the river, the little "after-image" display will show only the hand(s) that Bodog showed itself. If the loser mucks without showing, the HUD will not display those cards, even though I can retrieve that information by going into Bodog's "last hand" history. In other words, the data is there, but not displayed. The ability to skip the time-consuming and distracting step of opening the last-hand history page was one of the chief reasons I wanted a HUD in the first place, and the damn software won't do it consistently. I know that this is a very powerful analytic tool. Maybe I have something set wrong. But good software design makes at least the most basic and commonly used features easy to find and use. With good design, a user should be able to ask himself, "What would be the easiest or most obvious way to make X happen?" and then find that, lo and behold, that is exactly what works. Tracker has not even a trace of such thoughtful design. Most likely there are solutions to all of my problems, were I to invest enough time to learn the ins and outs, and navigate the thicket of bewildering menu options. But I don't want to. I want to play poker, I don't want to play Poker Tracker. It's supposed to be a tool that helps me, not something that requires more attention than the game itself. Tracker may be like the power of a snarling Lamborghini, but I really want something as simple and reliable as a Toyota Camry. I'd happily forego a complex feature set for ease of use and dependability. The bottom line: In addition to being buggy and unreliable, the program is complex, obtuse, opaque, and mysterious even when it's working the way it's supposed to. It's time to download Hold'Em Manager for its trial period and see if it's any better suited to my needs and expectations. "See a lot of cheap flops"
My friend Josie posted about a big tournament she recently played at Foxwoods, here. She says, "My modus operandi was to try to see alot of flops on the cheap and early. My guideline for these cheap flops was that I had to hit better than one pair to keep going otherwise muck after the flop." What follows is the comment I left on her blog. But after submitting it, I decided that I might as well post it here, too, since I spent some time writing it, and perhaps readers will find it useful. You didn't ask for my advice, but I think that is a lousy plan. The first problem is that if somebody raises behind you, you are faced with choosing between (A) abandoning the chips you already put in, or (B) playing a weak hand against a raiser from out of position. Not a very attractive pair of options, is it? The second problem is that you are relying on hitting a hand in order to win. So is everybody else limping in. You have no better chance of flopping a monster than anybody else. Playing this way levels the playing field and eliminates whatever edge in skill you might have. You're turning a poker tournament into a game of bingo. The third problem is that the great majority of the time you will not flop a monster, and you'll have to fold. This is a big leak of chips. Ever seen a water bill when you had a leaky faucet you didn't know about? Drip, drip, drip, one big blind at a time, your stack leaks down the drain. It is mathematically demonstrable that over the long run you will not win enough when you hit to make up for all the small losses you take along the way. As a general rule, calling (preflop or postflop) should be your LAST option. There are definitely situations where it is the best route, but you should always first try to find a reason for an aggressive action (bet or raise), secondly consider folding, and only if it's clear that neither of those is optimal consider a call. You are turning that basic, sound, universal strategy on its head by making a call your first choice. I defy you to find any well-regarded tournament strategy book or successful tournament player who advocates the approach you're describing. I'd bet you $100 you can't find one. There's a reason for that: IT'S A TERRIBLE STRATEGY THAT ONLY WEAK, LOSER PLAYERS EMPLOY! Now that I'm in my own forum, I can add a couple more thoughts. 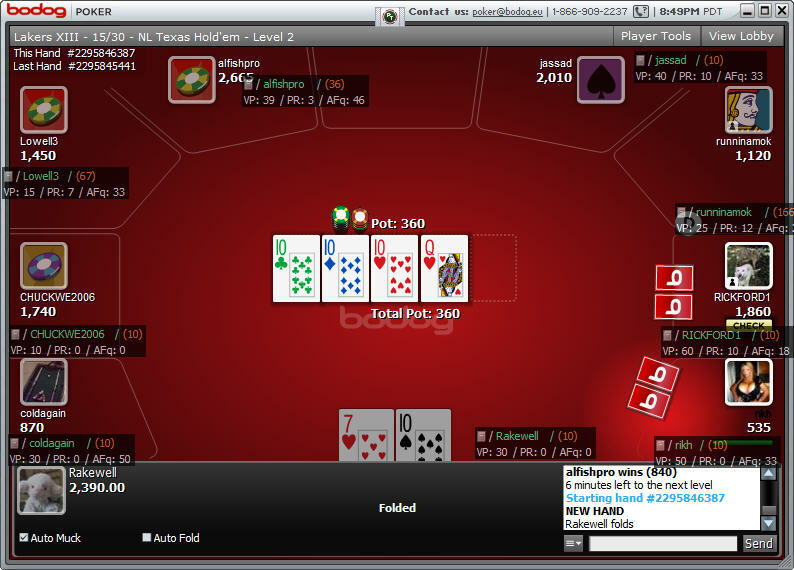 Yet another disadvantage of this plan is how transparent it makes your hand when you do finally catch a flop. Opponents know that you're limping a lot, but you're presumably still raising with your best starting hands. Ipso facto, they know even before the flop that you don't have a big pair, A-K, A-Q, etc. They also know that when you limp, this is followed by a fold on most flops, which sets you up to be bluffed the 98% of the time that you don't flop two pair or better. If you do bet or play back at their flop bet, they'll know you have a real hand, and they can give up with only a small loss--which means only a small win for you. Josie's post gave a concrete example of how this knowledge can be used, though in this case to her advantage. She had 10-6 on the button, with a flop of A-A-6. She called down a bluffer, confident that he didn't have an ace because he didn't raise pre-flop. Fine. But others can use exactly the same logic against you. You can't credibly represent having the ace the same way you could if you had raised on your button in that spot. A far, far better strategy is frequent, small raises. Make the same size raises with, say, 20% of your starting hands, consisting of a mix of big pairs, unpaired Broadway cards, small pairs, suited connectors, and a few random fliers, and your opponents will never be able to know whether you're betting the flop for value, as a bluff, or on a draw. When they are reduced to pure guessing about your hand, they will make a lot of mistakes, which translates to chips going your way. An alternative to making exactly the same size raise every time (say, 2.5 big blinds) is to vary it according to your position and the number of players who limped in ahead of you. That is, you generally want to play bigger pots when you have better position, smaller pots when out of position, all else being equal. You can also sensibly raise more after a bunch of limpers than when everybody has folded to you, because the pot has already grown, and you want to make the pot odds less attractive for the bottom-feeders. But the size of your raise should never be dependent on the strength of your down cards. Bet sizing tells are among the easiest for opponents to spot patterns in. Limping begets limping. You may be excited when your 6-5 offsuit hits a 9-6-5 flop, but the guy who you let in cheap with 9-6 likes it even better, and may take your whole stack. He would have folded if you had raised with your little connectors. Limping makes exactly nobody afraid of you. Limping never forces your opponents to make a difficult decision. Finally, consider this: You never win the pot pre-flop by limping. You can never steal the blinds with a limp. You never induce a better hand to fold by limping. I certainly understand the appeal of the "see a lot of cheap flops" approach. It's low-risk, loses chips only slowly, and once in a while scores you a big pot. It also is relatively simple to execute, requiring few hard decisions. But it simply cannot succeed over the long run. When it works, it's by sheer dumb luck going your way. That's no way for a skilled player to take on the game. Not only does this make you look like a weak player, it actually turns you into a weak player. I don't think there is a single thing to recommend it. Overlimping is not at all universally bad. It keeps you in the hand and gives you some chance to win a big pot. And in very aggressive games where people are raising and reraising like crazy, overlimping can often be your best play. But when the game is passive and many pots are being played five-, six-, or seven-handed for the price of the big blind, overlimping often handicaps you. It forces you to play primarily make-a-hand poker, and therefore it deprives you of many of your potential edges. Try raising instead. Doing so can tilt many pots to your advantage and enable you to exploit much larger edges. The bigger your edges, the more money you'll make. When I first read this, the phrase "make-a-hand poker" instantly struck a chord with me. It's one of those little nuggets that lodged deeply inside my brain. I will occasionally now catch myself playing this way (especially if I've stayed at the table for too long and I'm feeling fatigued), and that phrase will leap to the front of my mind as a self-scolding: "You're playing make-a-hand poker again, aren't you?" It will usually cause me to either return to my tight-aggressive baseline game, or decide that my A-game is gone and it's time to go home, both of which are much better choices than to stay in the loose-passive rut. So, Josie, if you find this way of thinking about the "see a lot of cheap flops" game plan enlightening, divide your thanks between Ed and me. Answer: Trick question! This is Casino Estoril near Lisbon, Portugal. 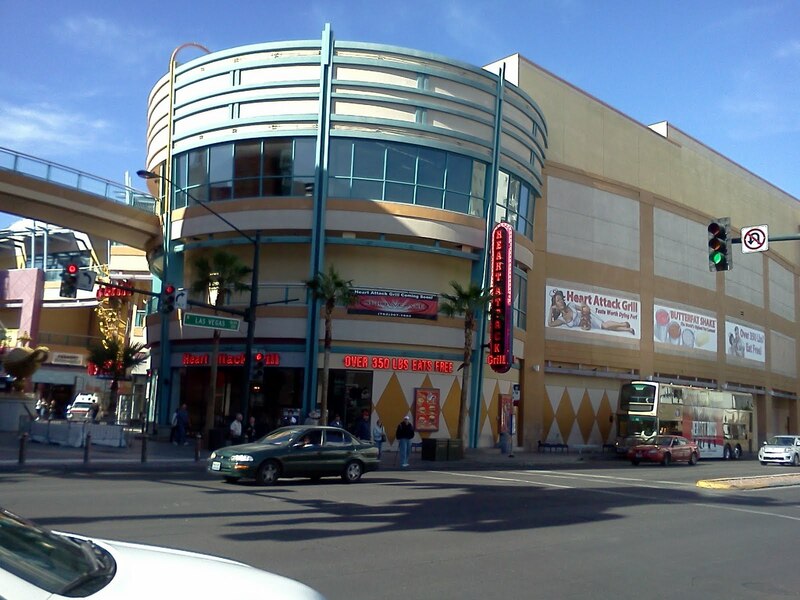 With thanks for photos submitted by reader "VegasDWP."